The Xiaomi-backed Yi brand has really made a name for itself as a company that sells high-quality consumer electronics products at surprisingly reasonable prices. This is especially true of Yi’s home security cameras, which are just as good as any big-brand cameras but far less expensive. Well if you thought Yi’s pricing was good before, just wait until you see what the company cooked up for Black Friday 2018. 4-Packs of Yi’s 1080p Home Security Cameras typically sell for $120, but they’re just $84 right now during Amazon’s Black Friday blowout. 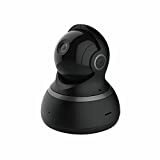 Then to round out your setup, you can snag $60 YI Dome Cameras that can pan, zoom, and automatically track and record movement for just $40.58 each.